OceanGate and BlueView Technologies helped to produce the first high-resolution, 3D digital model of a perfectly preserved, 100-year-old steamboat. In June 2010, using a new sonar scanning system provided by BlueView Technologies and OceanGate, the survey, which would have taken years to complete using traditional underwater archaeology techniques, took only days. The expedition team completed 130 dives over eight days and identified and tagged approximately 100 artifacts. Divers removed 28 of the most significant artifacts for future display in an AJ Goddard exhibit at the Yukon Transportation Museum. Another unexpected benefit of the expedition was the use of “citizen scientists,” citizens who volunteered their time or other resources so they could experience the rewards of scientific discovery. An entrepreneur from Seattle and a pilot from St. George, Utah, the citizen scientists were recruited by OceanGate Foundation, now Open the Oceans, whose mission is to enable individuals to gain nautical knowledge and experience while giving much-needed support to researchers. Beneath the frigid waters of Canada’s Lake Laberge lies shipwrecked treasure from the Klondike Gold Rush. But this is not about sacks of glittering gold. This “treasure” is the ship itself, the AJ Goddard – a perfectly preserved steamboat that appears to have been frozen in time for more than a century. 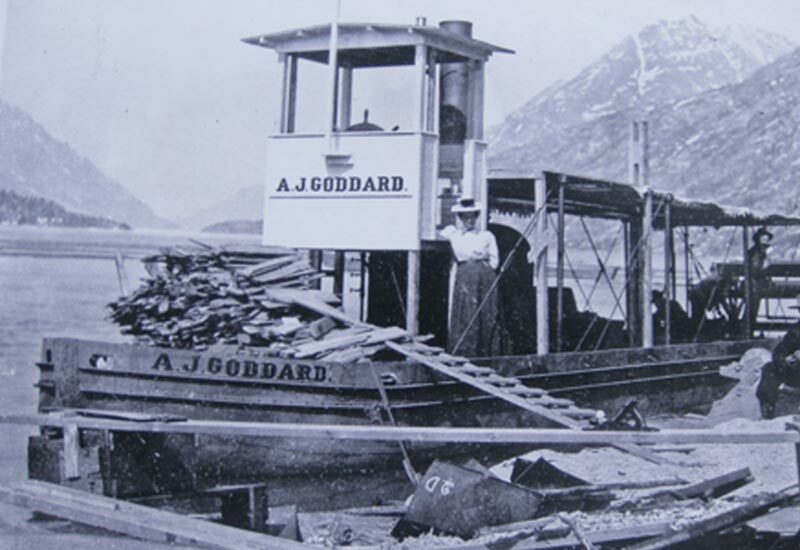 The AJ Goddard was just one of more than 200 steamships that transported prospectors and freight during the Klondike Gold Rush. The ship sank in 1901 and remained hidden for more than a century. In 2008, archaeologists searching for Gold Rush shipwrecks rediscovered the Goddard in about 30 feet of water at the edge of Lake Laberge. Although there are several shipwrecks from the Gold Rush era, the AJ Goddard is the most significant because it is so well preserved and has numerous artifacts associated with the day-to-day operation of these small, self-sufficient vessels. The Yukon government recently recognized the importance of this wreck, declaring it as a Yukon Historic Site that symbolized the “sense of adventure” that gripped North America at the height of the Gold Rush. In June 2010, OceanGate joined an expedition organized by the Institute of Nautical Archaeology to further investigate this important wreck. Over the course of eight days and approximately 130 dives, the expedition team recorded more than 100 artifacts on the wreck and recovered 28 items for display at the Yukon Transportation Museum. OceanGate and BlueView Technology played a significant role on this expedition, deploying a new 3D sonar scanning system to document the wreck. This effort produced the first high-resolution, 3D digital model of the famous shipwreck, providing researchers with exciting new details about frontier life during the adventuresome Gold Rush era. Over eight days, the team completed more than 130 dives on the AJ Goddard wreck, dividing their time on three main tasks: recording and retrieving artifacts, examining the hull structure, and deploying the BlueView sonar system. Approximately 100 artifacts were identified and tagged on the ship. Divers then removed 28 of the most significant artifacts for future display in a AJ Goddard exhibit at the Yukon Transportation Museum. While others concentrated on recording and retrieving artifacts, the OceanGate/BlueView team focused its efforts on deploying the BlueView 3D scanning system. The scanner was mounted on a tripod and then moved to multiple locations, collecting millions of data points from inside and outside the wreck. All of these data points were later combined to create a high-resolution, 3D digital model of the AJ Goddard. The BlueView technology allowed the team to capture details and geo-reference the data so it was spatially accurate, a task that would have taken hundreds or thousands of dives to do with a tape measure. The system also helped reveal details about how the ship was built. By suspending the BlueView unit upside-down inside a hatch, it provided a view of the ship that would have been otherwise unavailable. Images of the AJ Goddard were the first 3D views of the frontier-era steamer that disappeared in a winter storm in October 1901. The Institute of Nautical Archaeology (INA), who discovered the wreck at the edge of Lake Laberge in Canada’s Yukon wilderness in 2008, partnered with OceanGate and BlueView Technologies on an expedition to create a 3D survey of the wreck. The new BlueView scanning system, BlueView BV5000, allows archaeologists to easily scan underwater areas and complex objects, significantly advancing researchers’ capabilities to complete archaeological surveys of complex targets. 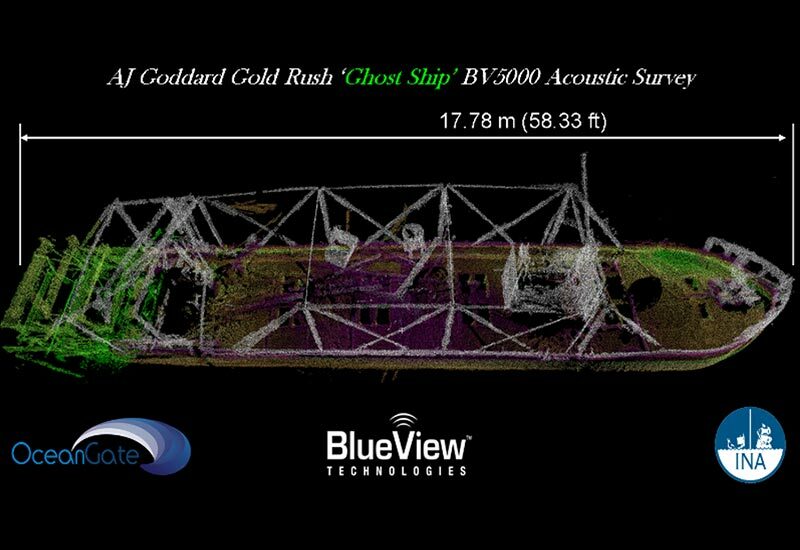 While the 2010 AJ Goddard expedition relied on a variety of more traditional tools to help explore and document the wreck, the real star was a 3D scanning sonar system (BlueView BV5000) provided by OceanGate and BlueView Technologies. The BlueView scanning system creates high-resolution 3D images of underwater areas and objects. And because of its small size, it can be easily deployed on a boat, tripod, or small ROV. This particular system has had great success within the oil and gas industry, but this is the first time it has ever been used for underwater archaeology. As demonstrated on the AJ Goddard, this scanner represents a significant technological breakthrough for documenting underwater shipwrecks. In a traditional archaeological survey, divers need to physically measure thousands of points on the wreck in order to accurately document the wreck’s condition, a task that could take years to complete. The BlueView system, however, is able to quickly scan a large target area from a stationary location, capturing millions of individual measurements in a matter of minutes. Although small, this system utilizes some amazing technology. It works by using sound waves to scan a thin, vertical sonar “slice” around the target. This single slice contains a large number of measured data points that represent a thin profile image of the target’s surface. This process is repeated until the sonar has captured a series of profile images for the entire target. The millions of data points from all the individual scans are then combined into a “point cloud” creating a final 3D model. Once the final digital model is created, it can be manipulated using different software applications. This allows researchers to make detailed measurements, create cross-sectional views, and even create 3D visualizations and virtual “flights” around and inside the wreck. The final 3D images of the Goddard show the capabilities of this new technology. Given this success, this technology is destined to play a significant role in future efforts to document historic underwater wrecks. Beneath the frigid waters of Canada’s Lake Laberge lies a shipwrecked treasure from the Klondike Gold Rush. The AJ Goddard – a perfectly preserved steamboat that appears to have been frozen in time for more than a century – operated until October 1901, when she was wrecked in an icy storm on Lake Laberge. Only two members of the five-man crew survived. The Goddard was just one of more than 200 steamships that transported prospectors and freight during the Klondike Gold Rush. After the ship sank, it remained hidden for more than a century. In 2008, archaeologists searching for Gold Rush shipwrecks rediscovered the Goddard in about 30 feet of water at the edge of Lake Laberge. Although there are several shipwrecks from the Gold Rush era, the Goddard is the most significant because it is so well-preserved and has numerous artifacts associated with the day-to-day operation of these small, self-sufficient vessels. The Yukon government recently declared it a Yukon Historic Site that symbolized the “sense of adventure” that gripped North America at the height of the Gold Rush. When team members conducted their first dives on the wreck in June 2009, they were amazed to discover that the shipwreck was literally an untouched time capsule. 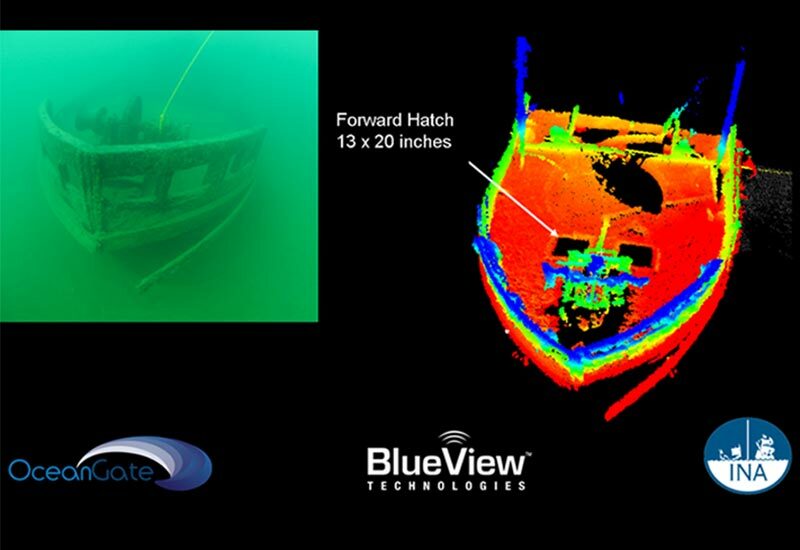 In June 2010, OceanGate and BlueView Technologies, played a significant role during an investigative expedition, deploying a new 3D sonar scanning system to document the wreck. This effort produced the first high-resolution, 3D digital model of the famous shipwreck, providing researchers with exciting new details about frontier life during the adventurous Gold Rush era. In 2010, a new expedition was formed to further explore and document the AJ Goddard. The team had 14 members from Canada and the United States, and included a unique combination of professional archaeologists, sonar experts, and citizen scientists. The expedition was organized by the Institute of Nautical Archaeology (INA) and led by archaeologist Lindsey Thomas from Texas A&M University. Lindsey was joined by several Goddard veterans, including John Pollack (Director of INA’s Yukon River Survey), Doug Davidge (Yukon Transportation Museum), and Tim Dowd (Yukon Government). Other archaeologists included Wayne Lusardi (State Underwater Archaeologist for Michigan) who served as the diving conservator for this project, and Valery Monahan (Yukon Government) who was there to help record the artifacts. Stockton Rush (OceanGate) and Jon Robertson (BlueView Technologies) also joined the expedition to lead the deployment of the new BlueView BV5000, a pioneering 3D scanning sonar system. Expedition objectives included mapping the ship’s construction features, primarily the hull details and the interior of the vessel, which would offer insight into how the hull was built. Additionally, the team wanted to record all of the artifacts and recover some artifacts to be used in a Goddard exhibit at the Yukon Transportation Museum. Remaining participants on the team were Sean Adams, Geoff Bell, Wayne Loeber, Gordon Rock, Mark Thomas, and Tim Vincent. These individuals were “citizen scientists” – participants who volunteered their time, diving or flying skills, or other resources to assist the expedition. Gordon Rock and Wayne Loeber are not archaeologists or famed underwater explorers. Yet, this entrepreneur from Seattle and pilot from St. George, Utah both played key roles on the international expedition that revealed new details about the AJ Goddard shipwreck. Their primary contribution was using Gordon’s jet and Wayne’s piloting skills to transport two team members and the high-tech sonar equipment provided by OceanGate and BlueView. They picked up the personnel and equipment in Seattle, and then flew to Ketchikan and on to Whitehorse, a trip of about 1,000 miles. Once they reached the expedition campsite, Gordon and Wayne quickly pitched in on a variety of tasks to support the expedition. One of their primary jobs was to shuttle personnel and equipment back and forth between the camp and dive site using a small inflatable boat. Gordon and Wayne both felt they contributed to the expedition’s success and also learned a lot in the process. “It was a thrill to be part of a discovery process,” Gordon said enthusiastically. “Much of the time we were right there on the wreck with the expedition team, listening as the divers discussed how they were going to position the sonar equipment and collect the data. Once the first sonar pictures started showing up on the computer, everyone was ecstatic. Historic image of the AJ Goddard. Photo Credit: Candy Waugaman. "Gold Rush Ghost Ship" Acoustic Survey. 3D scans compared to underwater photo. 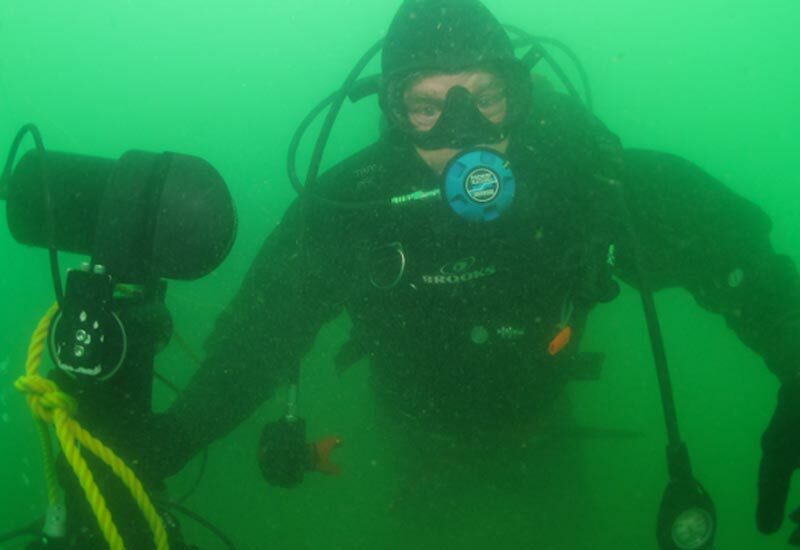 Diver with 3D sonar on tripod prepares for a scan of the wreck.